Tampa, FL – There is a real Viking living right here in Tampa, Florida! 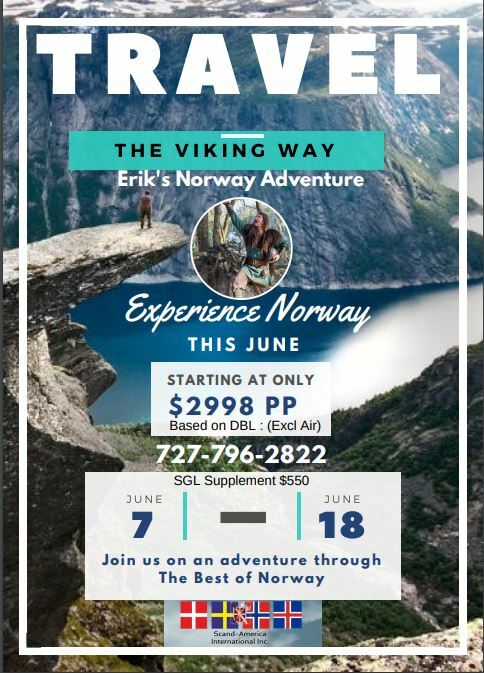 And, he’s inviting locals to join him on an exclusive 10-day expedition from Florida to Norway on June 7th 2019. This is an exciting trip that follows in the footsteps of the VIKINGS from the Epic Fjords to the unique and one-of a-kind cities of Norway. We’ll eat and drink just as the Vikings once did. This will be a journey that will always be remembered. Your guide, Eric Hovland, is an associate Curator and an “all-around Shark Guy” at the Florida Aquarium for 25 years. He is also the newly elected President of the Scandinavian Trade Association and has been featured on television shows in the U.S. and Scandinavia. He is proud of his heritage and enjoys teaching fellow Americans how the Vikings once lived and later discovered America. His insatiable curiosity and engaging personality on camera has won the hearts of local, national, and international audiences. In Eric’s own words, “Born for adventure. My dedication to science and discovery has taken me around the globe. From supporting habitat conservation of Rhinos in Kenya to diving the frigid fjords of Norway. From leading the charge to propagate sand tiger sharks in Florida to pursuing coral reef restoration in the Philippines. I have lived my life to travel and explore as a new world Viking”.